My first thought on hearing the news of the hostage situation in Sydney’s Martin Place this morning was ‘those poor, terrified people and their anxious families. What a horrible thing to happen!’ and then slightly irrationally (because fear can be irrational), I thought ‘and just before Christmas too’ as if this made the horribleness of the situation more horrible. The next thought I had was condolence to the Islamic population of Sydney and Australia who will, no doubt, be frightened by this situation not just because of the randomness of such an event happening in our peaceful country, but because they know, like they found out after September 11, that their communities will be blamed, hated, abused, discriminated against and generally shunned by large sections of the non-Islamic Australian community through no fault of their own. Perhaps they’re not just scared. If I were them, I would be furious. I was a teenager when the Port Arthur massacre happened, and I don’t recall there being a backlash at the time against white people with blonde hair. I’m a white person with blonde hair, and no one has ever heaped me into the ‘possibly a mass murderer’ bucket along with Martin Bryant. Or more recently, Norwegian Anders Breivik, who apparently killed 69 young political activists because he didn’t like their party’s immigration stance which he saw as too open to Islamic immigrants. In fact, in neither case do I recall the word ‘terrorist’ even being used to describe the mass murders of innocent people. It’s important to note, not that Murdoch’s Daily Telegraph cares to be accurate, that the flag photographed in the window of the café is not an Islamic State flag. We don’t know anything at all about the hostage takers yet, they may be Islamic State supporters, they may not. But Murdoch’s newspapers, and the bigots who take this news as truth won’t let unconfirmed facts get in the way of a good excuse for some old-fashioned fear mongering and racist bigotry. This ‘how-much-profit-can-we-drag-out-of-this-tragedy-that-we-know-barely-anything-about’ afternoon edition Daily Telegraph front cover makes the very dubious statement of ‘THE INSTANT WE CHANGED FOREVER’. But have we changed? The only thing that I can see as having changed in this situation is the level of comfort bigots feel about being openly racist towards people of Islamic faith. And that’s the very real, very scary, very confronting part of this tragedy. Not just that this shocking, violent siege can happen to innocent people on a quiet Monday morning a week before Christmas. 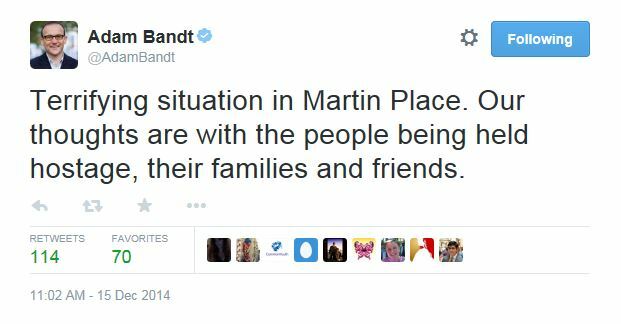 The tweets to Adam Bandt show a side of Australia that we all know is there, but we prefer not to think about. These bigots are the reason asylum seeker policy is such a political hot potato in this country, and why Tony Abbott is able to be elected promising to ‘stop the boats’. These nasty racist people aren’t a rarity. And they vote. Welcome to Australia. We haven’t changed a bit. Hi Victoria. Again another good little article from you. Oh yes, as always, underneath lies our White Australia policy, which is never far away when it’s dusted off occasionally by a few Australian home grown xenophobia village idiots. As for the person who is holding hostage these people in Sydney. I will await the outcome before passing judgement to the reasons behind this tragedy. Like it is not the first time these hostage dramas are played out on national TV and radio, although they are always linked to family violence, where I’m afraid someone ends up dead if not more innocents are killed in the process. I hope this siege ends peacefully. Deport them all…….children are terrified of those garbaged bagged hideously oppressed people……If we are in their countries WE have to abide by their rules !!! Now they are here and abusing ours. We will never be able to live alongside them . Just start deporting them !! That’s an “Aussie” name Katerina. Where are you from? Should we deport you too? Hi Victoria. I’m extremely annoyed that every time someone from another culture commits some kind of unlawful act, the entire culture is looked upon with distaste rather than just the individual culprit who is behaving insanely and against the law of the land. I had the very same thought as you today about blonde, brunette, black and red colours etc., when I heard of the news surrounding the hostages. And immediately I thought, here we go, they’re going to look upon that race with crossed eyes again. I hope I’m wrong, because it is time human beings evolved beyond being mere beasts and that we can look at the criminal for his own actions and treat him according to the law he is ruled under, and not put blame on his place of birth as the maker of all criminals. Agreed. So often those who condemn don’t know who they condemn and aren’t curious to find out. Still there’s a hashtag trending that may start to change all that #illridewithyou. You didn’t help by calling it “Islamic text”. Neither did the air-headed Channel 7 breakfast host who used the same phrase on Radio National at lunchtime today. If the translation provided on theaimn.com–where your post is reblogged–is correct, then it probably is. But no one who used that phrase earlier knew that because they, like most of us commenting here, don’t read Arabic. The language we toss around carelessly fuels the hatred. WordPress ate my comment. Victoria’s post was rebooted on theaimn.com where a commenter provided a translation. This is what I referred to above. iOS ate my word… Reblogged! Top article, yet again, Victoria. Here is what that vile sociopath (& this confirms the diagnosis) Rupert Murdoch tweeted – “AUST gets wake-call with Sydney terror. Only Daily Telegraph caught the bloody outcome at 2.00 am. Congrats.”. All he cares about is not that innocent people lost their lives but that he believes his ghastly piece of filth of a newspaper, the Daily Telecrap, had what he thought was an ‘exclusive’. Never mind it’s afternoon wrap-around was wrong in so many ways. Interestingly, the perpetrator was granted asylum during the Howard era & was an Iranian which means he is not an Arab. He was also a nutter who acted alone & was out on bail on charges of accessory to murder & sexual assault. Yes, he was a terrorist, as was Martin Bryant, but he wasn’t an “Arab terrorist” nor a member of the Daesh or IS.. There is a difference between a Terrorist, people who use terrorism as a means to fight a war to achieve their political or religious goals and a gunman like Martin Bryant. Blonde haired people generally don’t have an agenda against the rest of mankind. Islamic Jihadist extremeist do. You used a bad example to make what otherwise was a good point. @Gary Gillam. 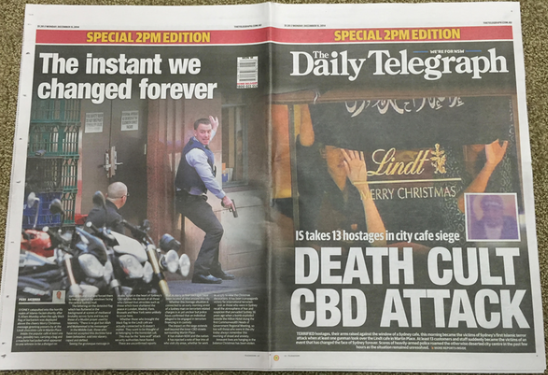 You appear to be using the Murdoch rags’ definition of ‘terrorist’. 1.a person, usually a member of a group, who uses or advocates terrorism. 3. (formerly) a member of a political group in Russia aiming at the demoralization of the government by terror. 4.an agent or partisan of the revolutionary tribunal during the Reign of Terror in France. The “fake sheik” or cleric Man haron monis was not a member of any terrorist group or ‘jihadi’. As for “Blonde haired people generally don’t have an agenda against the rest of mankind”., well tell that to the families of the children & adults slaughtered like game animals by blonde Anders Breivik or of those murdered by almost-blonde Timothy McVeigh. Both of these cold-blooded murderers certainly did have a an agenda as did Martin Bryant. Not everything is cut & dried, black or white. *Man Haron Monis* although he doesn’t deserve any capitals.